MJPM Saint Gaudens and Indian Head Four coin U.S. Gold set CERTIFIED BY YOUR CHOICE PCGS or NGC. 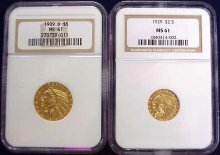 Our pre 1933 U.S. Gold type set is a four coin set of your choice of MS grade/condition (MS=mint state 63, MS64, and MS65 ) and certified by PCGS or NGC. 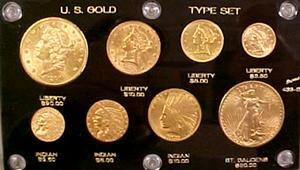 The set contains an example of the $20 St. Gaudens, $10 Indian, $5 Indian, and the $2-1/2 Indian gold coins. MJPM Liberty Head Four coin U.S. Gold set CERTIFIED BY YOUR CHOICE PCGS or NGC. 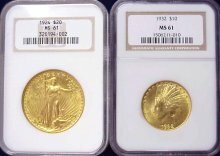 Our pre 1933 U.S. Liberty Gold type set is a four coin set of graded MS grade/condition (MS=mint state 63, MS64, and MS65 ) by PCGS or NGC. The set contains an example of the U.S. $20 dollar, $10 dollar, $5 dollar, and $2-1/2 dollar Liberty Head gold coins.